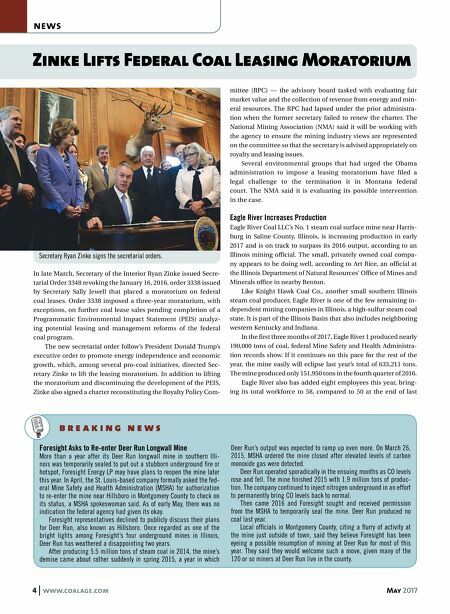 4 www.coalage.com May 2017 news Zinke Lifts Federal Coal Leasing Moratorium In late March, Secretary of the Interior Ryan Zinke issued Secre- tarial Order 3348 revoking the January 16, 2016, order 3338 issued by Secretary Sally Jewell that placed a moratorium on federal coal leases. Order 3338 imposed a three-year moratorium, with exceptions, on further coal lease sales pending completion of a Programmatic Environmental Impact Statement (PEIS) analyz- ing potential leasing and management reforms of the federal coal program. The new secretarial order follow's President Donald Trump's executive order to promote energy independence and economic growth, which, among several pro-coal initiatives, directed Sec- retary Zinke to lift the leasing moratorium. In addition to lifting the moratorium and discontinuing the development of the PEIS, Zinke also signed a charter reconstituting the Royalty Policy Com- mittee (RPC) — the advisory board tasked with evaluating fair market value and the collection of revenue from energy and min- eral resources. The RPC had lapsed under the prior administra- tion when the former secretary failed to renew the charter. The National Mining Association (NMA) said it will be working with the agency to ensure the mining industry views are represented on the committee so that the secretary is advised appropriately on royalty and leasing issues. Several environmental groups that had urged the Obama administration to impose a leasing moratorium have filed a legal challenge to the termination it in Montana federal court. The NMA said it is evaluating its possible intervention in the case. Eagle River Increases Production Eagle River Coal LLC's No. 1 steam coal surface mine near Harris- burg in Saline County, Illinois, is increasing production in early 2017 and is on track to surpass its 2016 output, according to an Illinois mining official. The small, privately owned coal compa- ny appears to be doing well, according to Art Rice, an official at the Illinois Department of Natural Resources' Office of Mines and Minerals office in nearby Benton. Like Knight Hawk Coal Co., another small southern Illinois steam coal producer, Eagle River is one of the few remaining in- dependent mining companies in Illinois, a high-sulfur steam coal state. It is part of the Illinois Basin that also includes neighboring western Kentucky and Indiana. In the first three months of 2017, Eagle River 1 produced nearly 190,000 tons of coal, federal Mine Safety and Health Administra- tion records show. If it continues on this pace for the rest of the year, the mine easily will eclipse last year's total of 633,211 tons. The mine produced only 151,950 tons in the fourth quarter of 2016. Eagle River also has added eight employees this year, bring- ing its total workforce to 58, compared to 50 at the end of last b r e a k i n g n e w s Secretary Ryan Zinke signs the secretarial orders. Foresight Asks to Re-enter Deer Run Longwall Mine More than a year after its Deer Run longwall mine in southern Illi- nois was temporarily sealed to put out a stubborn underground fire or hotspot, Foresight Energy LP may have plans to reopen the mine later this year. In April, the St. Louis-based company formally asked the fed- eral Mine Safety and Health Administration (MSHA) for authorization to re-enter the mine near Hillsboro in Montgomery County to check on its status, a MSHA spokeswoman said. As of early May, there was no indication the federal agency had given its okay. Foresight representatives declined to publicly discuss their plans for Deer Run, also known as Hillsboro. Once regarded as one of the bright lights among Foresight's four underground mines in Illinois, Deer Run has weathered a disappointing two years. After producing 5.5 million tons of steam coal in 2014, the mine's demise came about rather suddenly in spring 2015, a year in which Deer Run's output was expected to ramp up even more. On March 26, 2015, MSHA ordered the mine closed after elevated levels of carbon monoxide gas were detected. Deer Run operated sporadically in the ensuing months as CO levels rose and fell. The mine finished 2015 with 1.9 million tons of produc- tion. The company continued to inject nitrogen underground in an effort to permanently bring CO levels back to normal. Then came 2016 and Foresight sought and received permission from the MSHA to temporarily seal the mine. Deer Run produced no coal last year. Local officials in Montgomery County, citing a flurry of activity at the mine just outside of town, said they believe Foresight has been eyeing a possible resumption of mining at Deer Run for most of this year. They said they would welcome such a move, given many of the 120 or so miners at Deer Run live in the county.